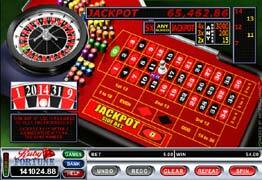 Next to Blackjack, Roulette is one of the more recognized and popular modern Casino games. Bets are placed on the table marked with boxes containing individual numbers. Once a bet is placed, the wheel is spun and the ball released. The winning number is determined by where the ball stops. Roulette Royale is based on standard Roulette, and has a side bet that makes you eligible for additional payouts, one of which is the Progressive Jackpot. To play Roulette Royale you need to be a Real Account user. 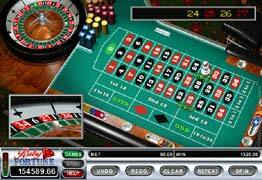 Roulette is one of the oldest and most popular casino games in the world. It is also one of the simplest to play. The game of American Roulette consists of a wheel with 38 stops, and a ball that can land with equal chance in any of those stops. Players make wagers by placing chips in the betting areas of the Roulette table. After all bets are placed, the ball is spun and eventually lands on a number. Wagers placed on the winning number or on groups that include the winning number are paid a multiple of the bet. The house collects all other wagers. To play the game of Roulette, place your bets by placing chips on the Roulette table.